A Pulitzer Prize-winning journalist follows an embattled Little League team in inner-city Newark, revealing the complex realities of life in one of America's most dangerous cities. When Rodney Mason, an ex-con drug dealer from Newark's rough South Ward, was shot and paralyzed, he vowed to turn his life around. A former high-school pitching ace with a 93-mph fastball, Mason decided to form a Little League team to help boys avoid the street life that had claimed his youth and mobility. Predictably, the players struggle - they endure poverty, unstable family lives with few positive male role models, failing schools, and dangerous neighborhoods - but through the fists and tears, lopsided losses and rare victories, this bunch of misfits becomes a team, and in doing so gives the community something to root for. 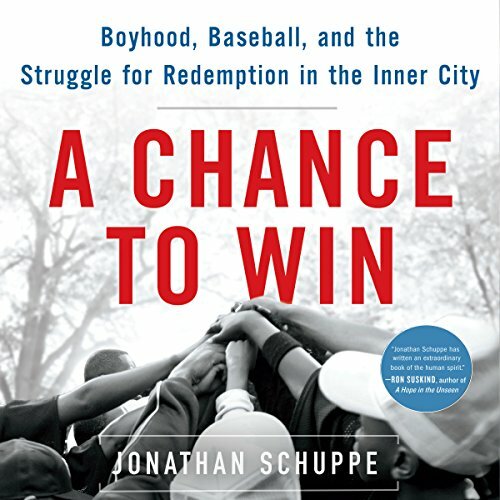 With in-depth reporting, fascinating characters, and vivid prose, Jonathan Schuppe's book is both a penetrating, true-to-life portrait of what's at stake for kids growing up poor in America's inner cities and a portrait of Newark itself, a struggling city that has recently known great hope as well as failure. ©2013 Jonathan Schuppe (P)2014 Audible Inc.
What did you love best about A Chance to Win? Schuppe writes honestly and conveys the lives of the people he's writing about. He tells his story eloquently and thoroughly. He's not often lyrical. He can be matter of fact, even a little clipped in describing the challenges facing his characters and what those challenges show about the world. But that disciplined style let me get to know the people. I also got to know Schuppe a little bit. Some of the things in this book are heartbreaking. Some made me hope for the future. Schuppe isn't the kind of writer who says, "Hey, look at me, how committed I am to these people." He's not the type of writer who wrings his hands. He follows the story. He appears to be comfortable leaving some questions unanswered, or partially answered, in a way that leaves room for the reader to continue the narrative on his own. I really appreciate that kind of writing. Scope, flexibility, honesty, balance, truthfulness. See above. Have you listened to any of L. J. Ganser’s other performances before? How does this one compare? I didn't give this 5 stars because I try to stay from the best or worst possible rating unless I'm really adamant about a book. This is a good solid book with a capable narrator. So for me, five stars is A++++. This is a good, solid A.